In Wisconsin, which has become a focal point in this debate, public servants already take a pretty hefty pay cut just for the opportunity to serve their communities (Keefe 2010). The figure below shows that when comparing the total compensation (which includes non-wage benefits such as health care and pensions) of workers with similar education, public-sector workers consistently make less than their private–sector peers. Workers with a bachelor’s degree or more—which constitute nearly 60% of the state and local workforce in Wisconsin—are compensated between $20,000 less (if they just have a bachelor’s degree) to over $82,000 a year less (if they have a professional degree, such as in law or medicine). It is necessary for making true apples-to-apples comparisons to control for worker characteristics such as education in order to best measure a worker’s potential earnings in a different sector or industry. Controlling for a larger range of earnings predictors—including not just education but also age, experience, gender, race, etc., Wisconsin public-sector workers face an annual compensation penalty of 11%. Adjusting for the slightly fewer hours worked per week on average, these public workers still face a compensation penalty of 5% for choosing to work in the public sector. The deficit that Wisconsin faces is caused by the current economic downturn and the recent tax cut package. It has nothing to do with the compensation of the people that educate our children, keep the streets safe and clean, keep dangerous chemicals out of our water, and keep insurance companies from taking advantage of us. These public servants are already paid less than those in the private sector, and nationally, this gap has actually been increasing over the past few decades (Bender and Heywood). Instead of opportunistically using these hard times to target workers who—because of their public service—already take a substantial pay cut, Wisconsin politicians should focus on creating jobs and boosting the incomes of all workers. Bender, Keith and John Heywood, 2010. “Out of Balance: Comparing Public and Private Sector Compensation over 20 Years”, National Institute on Retirement Security, Washington, D.C., April. Keefe, Jeffrey H. 2011. 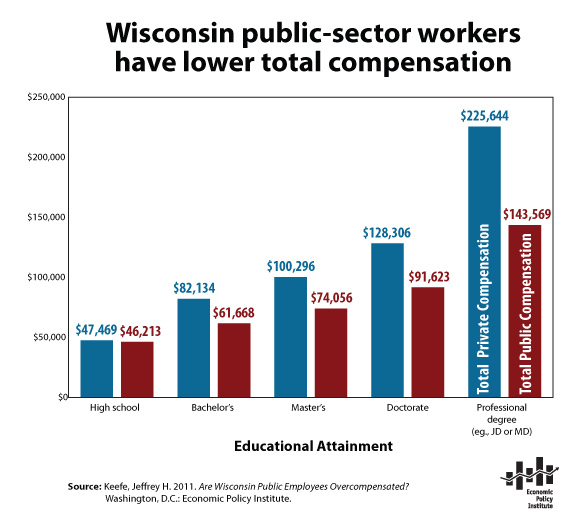 “Are Wisconsin Public Employees Overcompensated?“, Economic Policy Institute, Washington, D.C., February 10.